We're sipping cozy maple bourbon ciders. We chat about creativity and how it makes us better humans. The Creative Habit and Bird by Bird are some of our greatest inspirations on taking our creative work seriously. Besides books, we're inspired by other brilliant ladies. 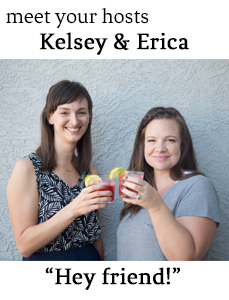 Erica tells the story of finally breaking in to Kelsey's elite book club, and we share about being the founding members of Creative Club and assembling your board of directors. We also check in on our New Year's resolutions/goals and discuss Mission Hot Mom and Operation Hide the Bike. In an act of camaraderie and brutal honesty, we peek inside our makeup bags and divulge our morning beauty routines or lack thereof. Kelsey wants to amp up her routine, and Erica feels very passionate about this topic in part thanks to the Makeup Geek. To end the show, Kelsey tells the best story ever about our neighborhood, involving Hell's Angels and a not so neighborly sign that was erected.